Cook the pasta following the instructions on the box. In a bowl, beat the eggs and mix with the cheese. Set aside. In a large pan, cook the bacon until it’s crunchy and save the oil. Remove the bacon. In the same frying pan, at medium heat, add garlic and cook for about 5 minutes or until it starts to brown. Add pasta and egg mixture to the pan. Mix and let cook for 5 minutes on low heat. Serve and sprinkle with chopped parsley. For a more sophisticated version, use whole-wheat pasta and add a little bit of white wine as the garlic is cooking. Pasta has always been one of my favorite ingredients and I always have some in my pantry because it can be prepared in many different ways, and it’s very economic. It’s a very useful ingredient to have since you can make so many recipes with it, from exotic to very basic. I remember when I was student I used to make pasta almost every day, just by adding whatever sauce I had available. 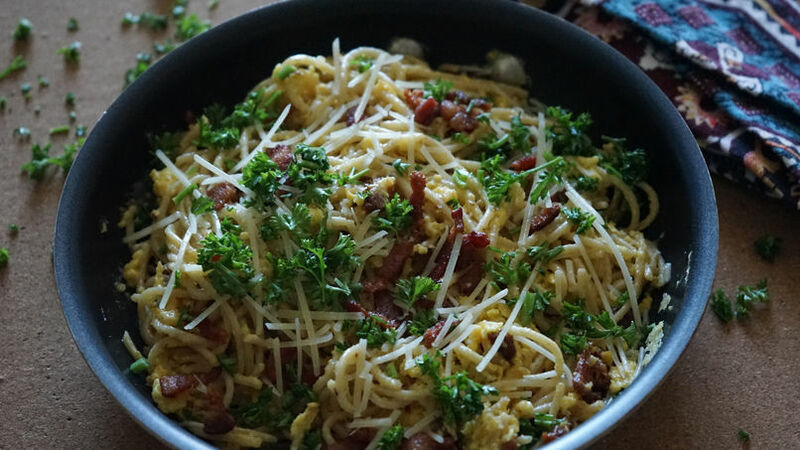 One of my favorites, and also one that’s very economic, is spaghetti carbonara. This recipe only requires a few ingredients and can be ready in less than 20 minutes.